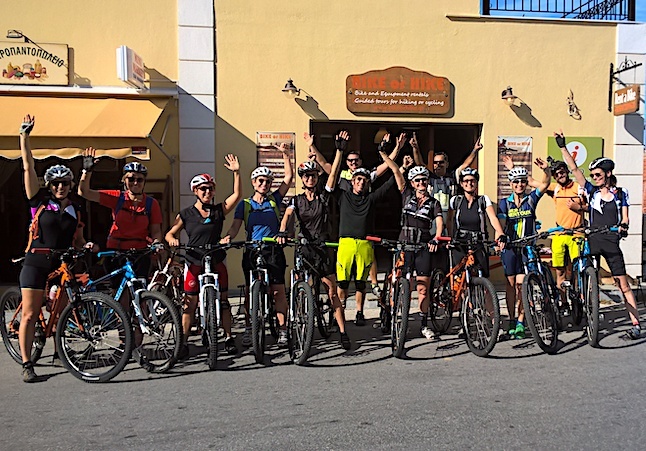 Since 2017 we organize mountain bike tours in Greece and South Portugal. On the one hand, Pagasitikos Bay, on the other, the Aegean Sea. In the middle - the majestic mountain Pelion. 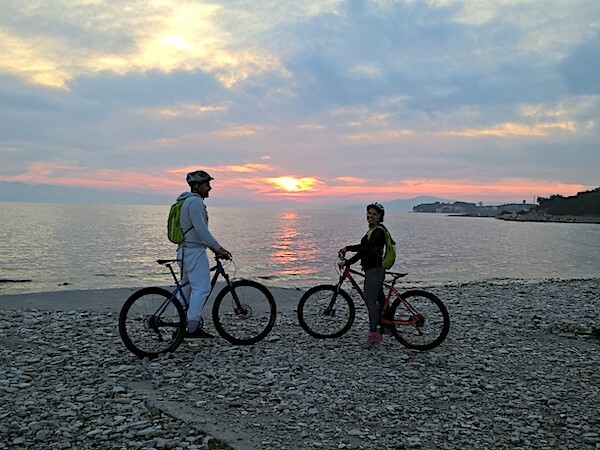 This 9-days combined tour includes cycling, hiking on a picturesque island and traveling on board in the sea will make you discover Pilio (also known as Pelion) is a beautiful mountain in central Greece that combines tradition with high quality holiday conditions. The area offers a beautiful combination of mountain and sea. It is no coincidence that the gods of Olympus chose Pilio as a place of rest and vacation. departing / arriving from ATHENS. We also implement this tour in 7 days. Approximately 150 km in 6 days (90% of trails and paths) with guide provided. Kids can join on the responsibility of their parents if they are at least 12 years old. After breakfast, start for the first leg of the trip from Portaria (alt. 650 m) to Agios Lavrentios (alt 600 m). One stop will be at the village square of Drakeia, which has a spring and traditional serving coffee under the huge plane tree. 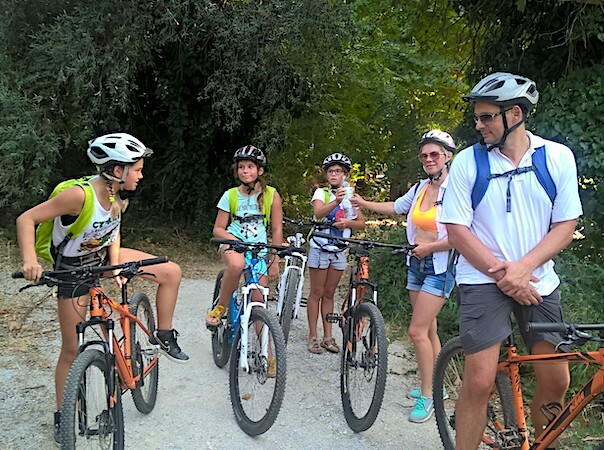 The day's trail ends in Agios Lavrentios, where you will be taken to the hotel****. The rest of the day is free for everyone to enjoy the area, spectacular views, a beer or ouzo. 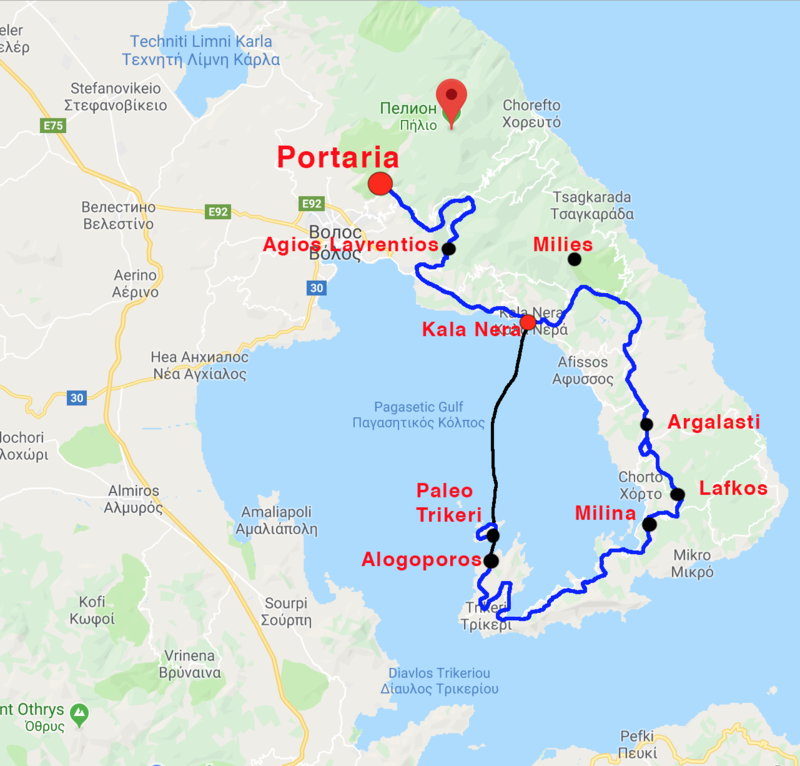 DAY 7.Milina - Alogoporos (Trikeri): 32 km - 3 hours of riding The route is from Milina to Alogoporos is along a quiet and safe minor asphalt road following the coastline. In Alogoporos the bike tour ends, but not our trip. We leave the bikes and travel by boat across to the island of Trikeri - a small island in the Pagasitikos Gulf where there are no cars. The stay will be in an old monastery at the top of the island. There is no luxury, but there is the magic of being in a historical area that has played a prominent role in local history for many years. We will walk the trails of this unique island where the words noise and pollution are unknown. In seaside tavern's we will eat fresh fish and swim in the beautiful deserted beaches. DAY 8. Alogoporos (Trikeri) - Kala Nera This day includes hike around the island trails and visit some nice beaches. At 16:00 we board a tour cruise boat to cross the Pagasitikos Gulf with crystal-clear waters and deserted islands, stopping off to dive in and enjoy a dip in the sea. 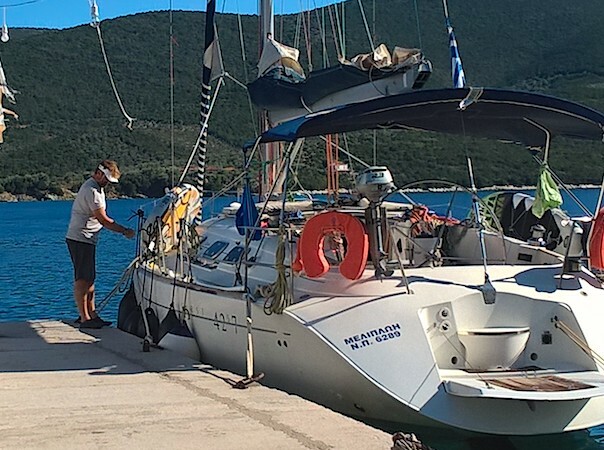 The journey ends at the port of Kala Nera, where we can have dinner and enjoy the night life. Stay overnight Kala Nera. Breakfast and enjoy the see and the area around Kala Nera. END OF TOUR – Transfer to the airport. 1.DISCOUNT FOR KIDS UNDER 18 - 150€ / kid. 2.SELF GUIDED DISCOUNT - 100€ / person. 3.We can increase the difficulty level of this tour at the request of the group (4,5 - 5 hours riding, 30-45 km per day). 4.Anyone who wishes not to participate in any of the above routes can be transported by car at no extra cost. 5.we may partially modify the program if it considers that there are reasonable grounds (e.g. bad weather, safety of participants, technical problems, etc.). 6.The organizers will arrange various activities for the participants during the tour. Depending on the dates, these might include, for instance, participation in local festivals, wine tastings, olive oil tasting.